When Choosing a bolder paint color, employ the color wheel to find the right accent colors to create cohesion. Image courtesy Behr. Choosing a color scheme for a room redesign can be daunting. You may see a color combination you love on Houzz or Pinterest but worry that you won’t be able to pull it off. However, once you commit to one or two colors, there are selection methods and sources of inspiration that can help you create a cohesive palette. And just as you start to use a new word confidently in sentences, you can learn how to incorporate a color or colors into room design. To some extent, flooring, cabinets, countertops and other “fixed” pieces will guide your color selections, she says. Of your existing furnishings that you intend to keep, try pulling colors from the largest patterned piece (an upholstered chair, a rug, an oil painting) to form the basis of the room’s palette. Another way to build a palette around your chosen color is to explore how artists and or Mother Nature have used it. Some art sites let you search and filter artworks by color, so a search for gray art on Artfinder.com turned up more than 22,000 paintings with workable color combinations — gray with white and blue, gray with shades of purple, and grays with pops of citrus yellow and orange. If you already have a piece of art in mind and you’d like to plan a color scheme around it, there are online tools to help. You can upload landscapes, a snapshot of an existing piece, vacation photos or any other image into an online color palette generator to extract various color schemes automatically. You can always fall back on the color wheel to determine which colors work together. Using the color wheel, an analogous color scheme includes any four adjacent colors. For example, analogous colors for yellow are yellow-orange, orange and red-orange going clockwise, or yellow-green, green and green-blue going counterclockwise. 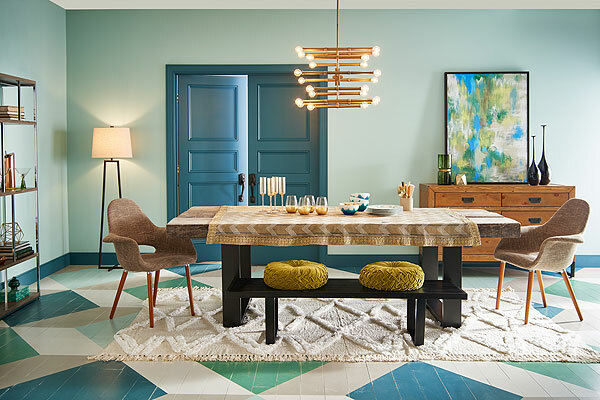 Analogous colors are low-contrast, harmonious and “a good way to add color to a space without looking like a bag of Skittles exploded,” Ott says. Directly across from each other on the wheel, complementary colors are high-contrast and high-energy. Red and blue are complementary, for example, but you don’t want to give them equal amounts of real estate. Typically, one of the colors would be used sparingly and one would be a toned-down version of a true opposite (blue and coral, for example), with liberal use of a neutral shade to “give the eye a rest,” Ott says. Choose a main, secondary, and accent color and apply them formulaically. The main color, typically a neutral, should take up about 60 percent of the space, which wall paint generally accomplishes. The secondary color takes up 30 percent and is generally upholstery, while a “wow” color for accents and accessories accounts for 10 percent, McCormick says.